Former Horsham overseas and now Sussex star Jofra Archer could make his England debut as early as next year owing to a ECB law change. The 23-year-old, who was born and raised in Barbados has been on England's radar for some time after shooting to stardom with Sussex and in the IPL. 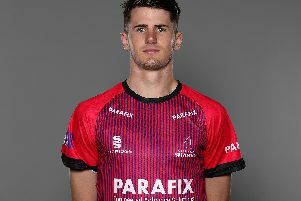 Under previous regulations, Archer would have not been eligible for selection, however, until 2022, qualifying under the seven-year residency qualification. But a board meeting a Lord's on Wednesday saw the legislation change from seven years to three, meaning that Archer, who plied his trade for Horsham in the Sussex League in 2016, is available for selection from next year. England tour the West Indies next year and Archer had hoped to make his debut in his home country of Barbados. The paceman, who was signed for £800,000 in the IPL auction at the start of the year tweeted: "It may or may not happen but I would love to debut in front of my family." But Sussex have played down the chances of that happening, stating that they don't expect their prize asset to qualifying for England selection until sometime in March. England's last of three Twenty20 internationals takes place on March 10. A statement, from the club read: "Following the ECB’s announcement this morning of updated regulations for England availability and subsequent media reports, Sussex Cricket would like to clarify the point at which our player Jofra Archer would become eligible for selection for the national team. "While the new regulations will come into force from January 1, 2019, the requirement for a player to have accumulated 210 days of residency over three years (April to March) will mean that Jofra is likely to qualify for England at some point in March 2019. "The exact date of Jofra’s qualification will depend on the time he spends out of the country during the rest of 2018/19. "Qualifying for England has long been an aim of Jofra’s and Sussex Cricket is delighted for him that this ambition will now be realised sooner than previously envisaged."